Human communication has been evolving for thousands of years and technological progress is continuously expanding the range of media that people use for exchanging information and talking to friends. One medium of communication which has become more popular over the years is the Instant Messenger in its various forms. WhatsApp is one of the most popular Instant Messengers. It offers multimodal functionalities that can be used to compensate for the lack of actual human contact and even beyond, for more complex purposes. This paper comprises three parts. 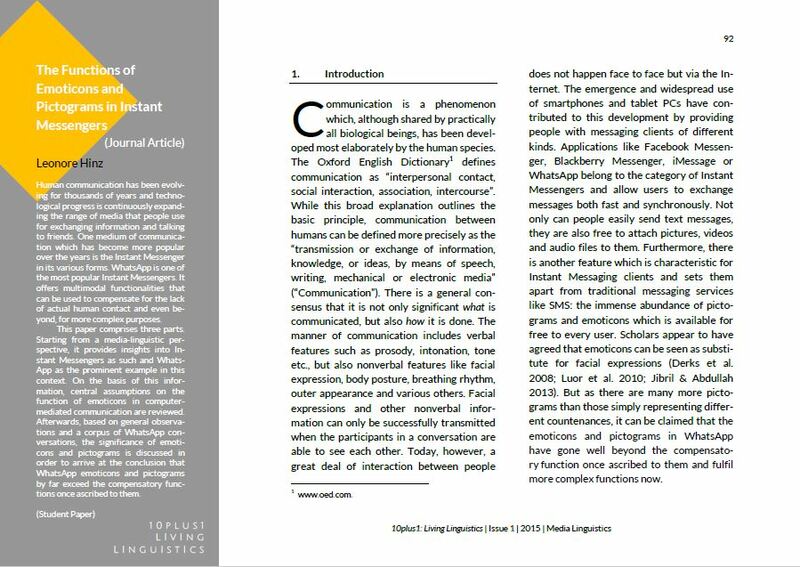 Starting from a media-linguistic perspective, it provides insights into Instant Messengers as such and WhatsApp as the prominent example in this context. On the basis of this information, central assumptions on the function of emoticons in computer-mediated communication are reviewed. Afterwards, based on general observations and a corpus of WhatsApp conversations, the significance of emoticons and pictograms is discussed in order to arrive at the conclusion that WhatsApp emoticons and pictograms by far exceed the compensatory functions once ascribed to them. Leonore Hinz is currently studying English and Linguistics at the University of Potsdam and will receive her Bachelor’s degree in 2016. Afterwards, she will pursue a master program in Berlin, expanding her knowledge of the English language and culture. Her research interests lie in the fields of media-linguistics, British literature and the bilingual brain.